Creating a new garden, landscape is a process. Each project is unique and we offer a wide range of services so the process doesn't always follow the same sequence, however more often than not it goes like that..
An initial chat over the phone and a few pictures emailed to us is a great way to kick things in and start a conversation. We can then agree on a date and time for an initial visit. Or start by sending an email with as much detail as possible regarding location, size of garden, project scope, challenges, budget (if possible). Feel free also to send a link to a Pinterest board if you have started one, let us know if an architect is involved in your project, basically as much information as possible. The initial visit consists of getting to know the garden and its surroundings, discussing a detailed design brief, timeline, process, budget, etc. After the initial visit, you will receive an email with the design brief and schedule of fees and stages for you to review. If you wish to go ahead, then the following steps will take place. Please note that the initial visit is free if you are within 2 miles from our office. Further out we will charge a call out fee (redeemable against design fees) for the initial site visit. This fee starts at £200 and will be confirmed by email depending on location and nature of the project. The site survey consists in taking measurements and spot levels, existing buildings, trees and planting that will be retained, site aspect, etc. For larger or complex sites, a full topographical survey is required, this will be sub-contracted to a trusted surveyor. We can organise this for you at cost. The site analysis is about recording the "feel of the place", views, elements to screen, privacy, existing materials, wind exposure and much more. 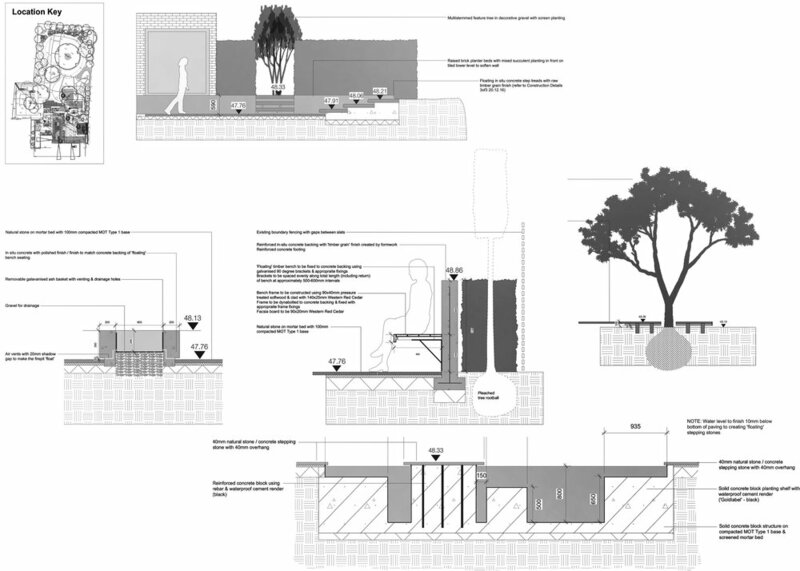 The concept design consists of a masterplan, a moodboard, 3ds and section drawings. Depending on the scale and nature of the project, the concept plan can be done in two phases (a first sketchy hand drawn drawing to be reviewed and played with, followed by a more defined drawing or straight into the latter). 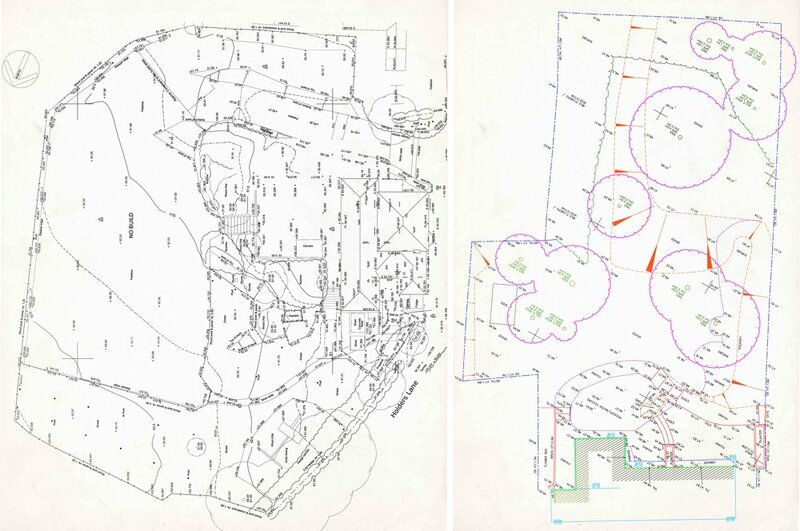 Once you're perfectly happy with the masterplan, it can be developed into a more detailed and working drawing. Construction drawings and specifications are also produced (see next step). A planning application is submitted at this point too if required. Once the masterplan is agreed we start detailing all the aspects of the design and produce a set of documents. This set of documents allows the scheme to be accurately costed and built to the right specifications and following our design intentions. The devil is in the detail so this is an important stage. 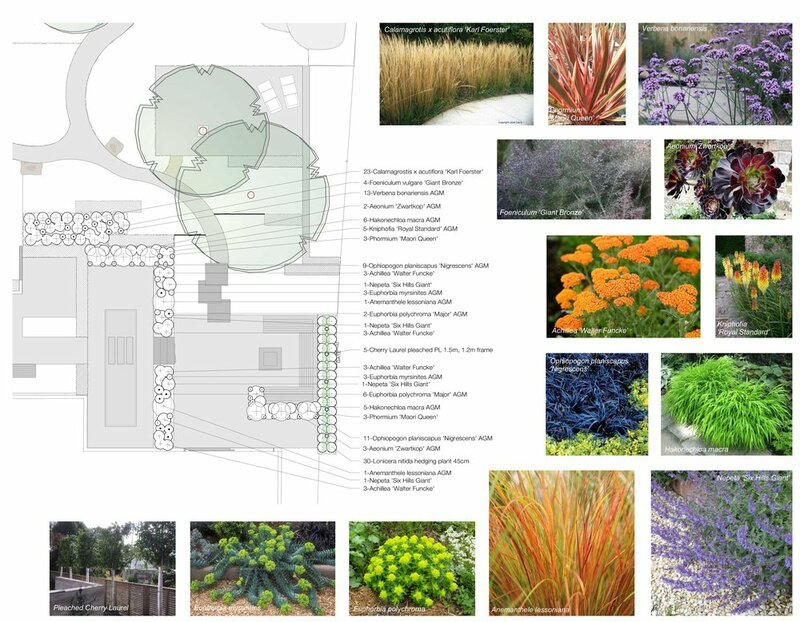 We produce planting plans to compliment the scheme, colour palette and of course suit the site aspects and conditions. The plant schedule (including species list, sizes and quantity) enables to source, quantify and cost the plants. The key plants are hand tagged by us. I have developed a trusted relationship with a few trade nurseries which I try and visit as often as I can as well as a few smaller specialist nurseries. The translation from paper to reality relies on the right contractors and a very good communication between them and the designers (us!). I have over the years nurtured strong relationships with trusted contractors, engineers, craftmens and other experts who share the same principles and passion as us. We will liaise with the contractors and suppliers to ensure that this happens as smoothly as possible. We will visit the site regularly to resolve all the issues or questions that arise during the build and report to the client. Not too much, not too little...there is an art to garden lighting and if you get it right, the result is magical!